An image released by NASA shows that Arctic sea ice has retreated to the point where both the Northwest Passage around North America and the Northern Sea Route around Russia are open simultaneously. The occurrence marks the first time on record that both passages have been open. Last month the National Snow and Ice Data Center (NSIDC) reported that Arctic sea ice extent has rearched the second-lowest level since record-keeping began. NSIDC said that in the final weeks of the melt season, the sea ice extent could challenge the record-low of 1.59 million square miles set last year. 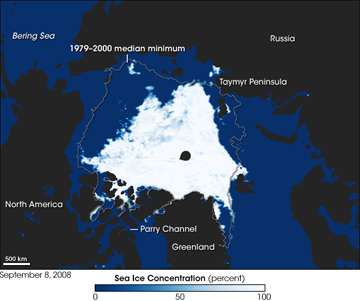 This image shows Arctic sea ice concentration on September 8, 2008, as observed by the Advanced Microwave Scanning Radiometer–Earth Observing System (AMSR-E) sensor on NASA’s Aqua satellite. The observations are collected on a pixel by pixel basis over the Arctic. The percentage of a 12.5-square-kilometer pixel covered by ice is shown in shades of dark blue (no ice) to white (100 percent ice). The gray line around the Arctic basin shows the median minimum extent of sea ice from 1979-2000. NASA image created by Jesse Allen, using data obtained courtesy of the National Snow and Ice Data Center (NSIDC). Caption by Rebecca Lindsey.